If you are the parent of an adolescent, you are surely aware of the allure of the screen. From the internet to video games to wanting to join social media at a younger and younger age, parents today –especially in the Silicon Valley – have to make decisions about their children's digital media usage that previous generations never had to grapple with. At the International School of the Peninsula, teaching responsible digital citizenship is part of our curriculm beginning in 3rd grade, and we believe that a thoughtful relationship with technology it is a key component of preparing students for the 21st century. 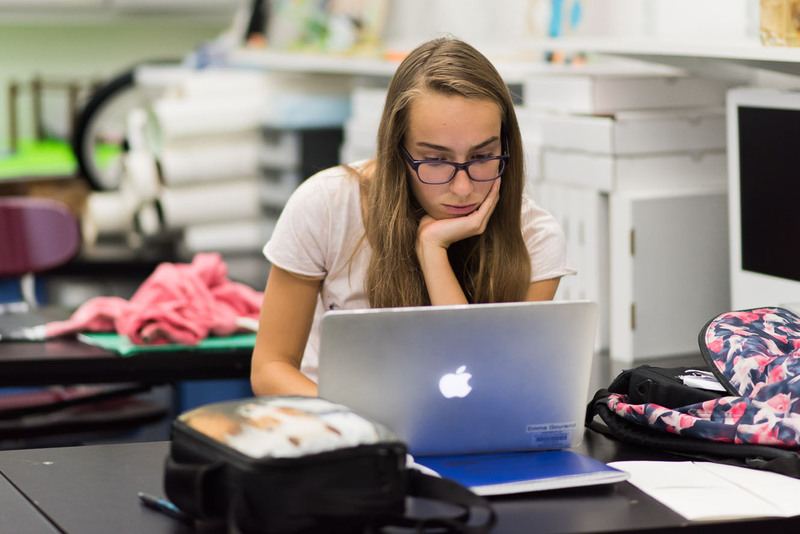 We use resources from Common Sense Media, an independent non-profit committed to "empowering students to think critically, behave safely, and participate responsibly in our digital world." As a result of our efforts, ISTP has been recognized as a Common Sense Digital Citizenship Certified School since 2015. Earlier this school year, ISTP also hosted a screening of the documentary "Screenagers: Growing Up in the Digital Age," and the movie's website is another great resource for parents looking to promote digital balance. Here are a few digital media tips you might consider for your tween/teen. 1. Designate tech-free zones and times. We strongly suggest that you make your child's bedroom a tech-free zone, set aside as a place to read, reflect, and relax. Some families also choose to designate family meals as a "no devices allowed" time – research shows that face-to-face conversations such as those over dinner improve mood and help develop empathy. 2. Restrict distractions & background entertainment during homework time. Multitasking is linked to less retention and decreased learning outcomes. The brain is only really capable of focusing on one task at a time, and overstimulation/constantly switching back and forth impedes its function. 3. Screen time can disrupt sleep. It is best for parents to restrict devices at least 30 minutes before bedtime. Many adolescents don't get enough sleep, and bringing screens to bed can further disrupt their sleep cycle. 4. Put the family computer in a central location. With the family computer out in the open instead of hidden away in a bedroom or office, you can more easily monitor your child's online activities. 5. Be involved in your child's use of media. Show interest in what your child is doing online by asking questions, looking at, and listening to the media they are consuming. Engaging in conversation or even just asking your child how to do something online will help keep channels of communication open. 6. Build a trusting relationship around technology. Work on building an open, trusting relationship with your adolescent when it comes to technology so that if he/she encounters a challenging situation online (mean or uncomfortable interaction, cyberbulling, aggressive media, etc. ), he/she is comfortable going to you to find help. Parents can build this type of relationship by acting as a guide to digital media rather than a judge. 7. Emphasize using social media responsibly. Social media can often be a forum for bullying. Discuss with your child how it is important not to post comments on social media that they wouldn't also say to someone in person, and that empathy and respect are just as important online as in the real world. 8. Girls are especially affected by the pressures of social media. According to Common Sense Media's 2015 study, teenage girls spend an average of 1.5 hours/day on social media (vs. 50 minutes for boys). Social media can lead adolescent girls to spend a lot of time thinking about their appearance, and can damage their self-esteem at a fragile age. You might choose to delay their use of instagram, snapchat, etc. until they are older and more mature. 9. Adolescents are susceptible to excessive video game usage. Internet and video game addiction is a growing phenomenon around the world, especially in adolescents. Evidence shows that educational video games can have a lot of value, teaching concepts, strategy, and cooperation. However, best-selling video games are often filled with violence, and Seattle Children's Hospital Director of Child Development Dr. Dimitri Christakis says, "There's no question from a scientific standpoint that playing these games decreases empathy, decreases sensitivity, and increases aggressive thoughts and actions." Consider limiting your child's video game time, or encouraging them to engage with educational games. 10. Help your child learn self-control and set them up for success. The part of the brain responsible for impulse control is not fully developed until our 20s, and with guidance, a teen can learn to develop more self-control over time when it comes to digital media. Self-control can be challenging, so parents can take steps to set their child up for success, such as decreasing temptation by building in time when devices must be out of sight in the home. Some parents also choose to use apps that will automatically turn off tech at certain times of the day. For more information and further guidance, be sure to check out Common Sense Media and the Screenagers movie website.